Rotating your tyres periodically can help to prevent uneven wear and prolong the lifespan of your tyres. When should you rotate your tyres? Generally speaking, it is recommended that you rotate the tyres on your vehicle once every six months, or 6,000 miles – whichever comes first. To do so, each tyres need to be removed and refitted at a different position. This helps to ensure that each tyre wears evenly and lasts longer. 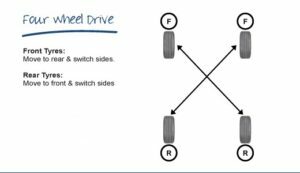 For each driving method, there is a correct way to rotate your tyres. You want to ensure that you rotate the tyres to the correct position for your vehicle. The two front tyres stay on the same of the car and are transferred to the rear. However, the rear tyres move forward and switch sides. The two rear tyres stay on the same side of the car and are transferred to the front. However, the front tyres move backwards and switch sides. In this instance both sets of tyres swap sides and position. So the two front tyres move back and switch. At the same time the two rear tyres move forward and switch. The above rules should not be followed if your tyres are ‘directional tyres’. 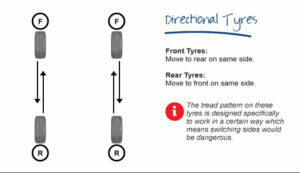 The tread pattern on this variety tyre is designed specifically to work in a certain way in relation to its position on the vehicle – switching sides would be dangerous. The tyres change position, but do not switch. 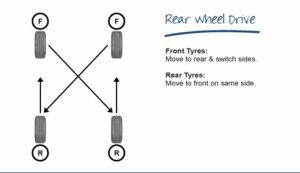 The two front tyres move back and the two rear tyres move forward – they stay on the same side of the car as before.